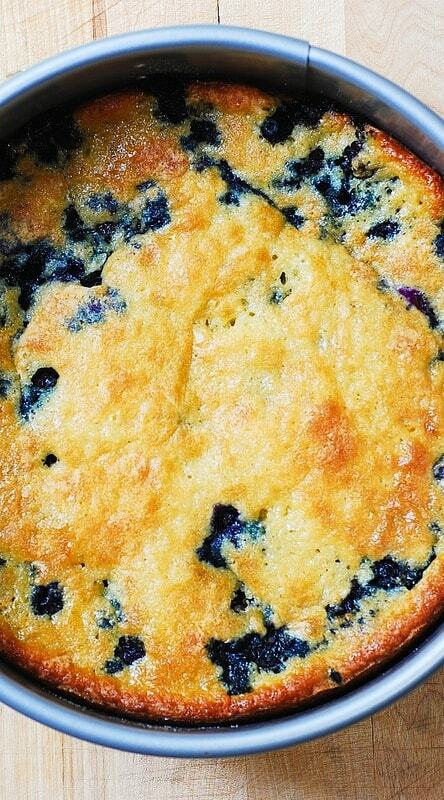 Delicious, easy-to-make, and beautiful Blueberry Greek yogurt Cake made in a springform baking pan. I love using Greek yogurt in baking, as it gives a richer texture to the cake batter. 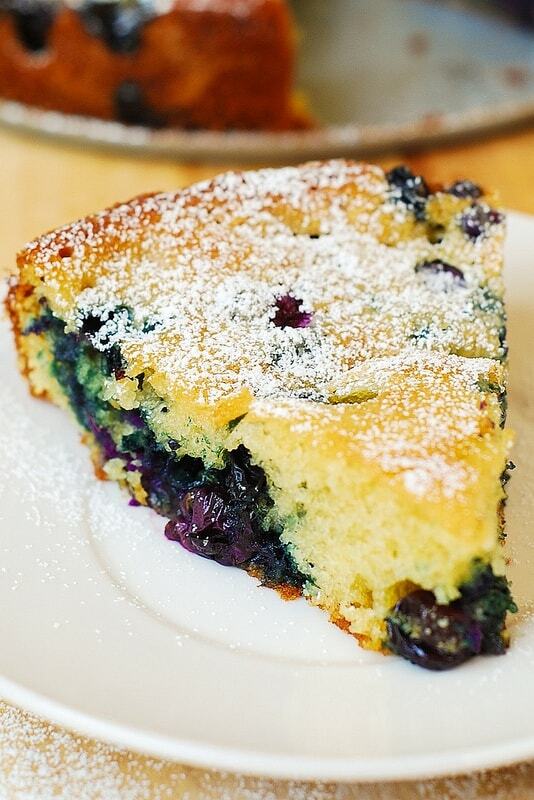 This blueberry Greek yogurt cake is very moist, not overly sweet, with an amazing texture. Use either a 9×3 springform pan (like I did) or a 9 inch round cake pan. The cake comes out just of the right height (not too short and not too tall), with the texture resembling clafoutis. Keep in mind it’s not an overly tall cake – but that’s how it’s supposed to be! Very soft and moist from Greek yogurt and the blueberries. 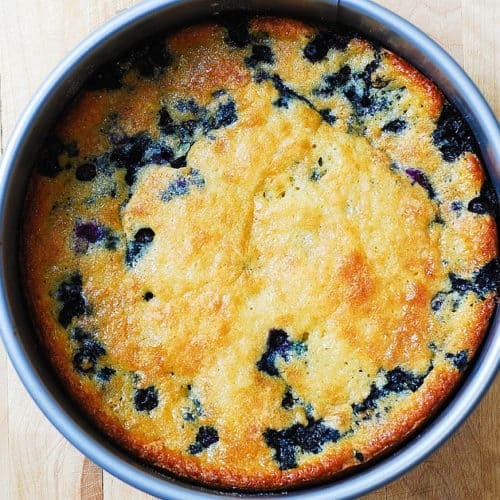 This blueberry Greek yogurt cake is very easy to make and turns out well every time! You can use all types of berries. This cake is great for using leftover fruit. 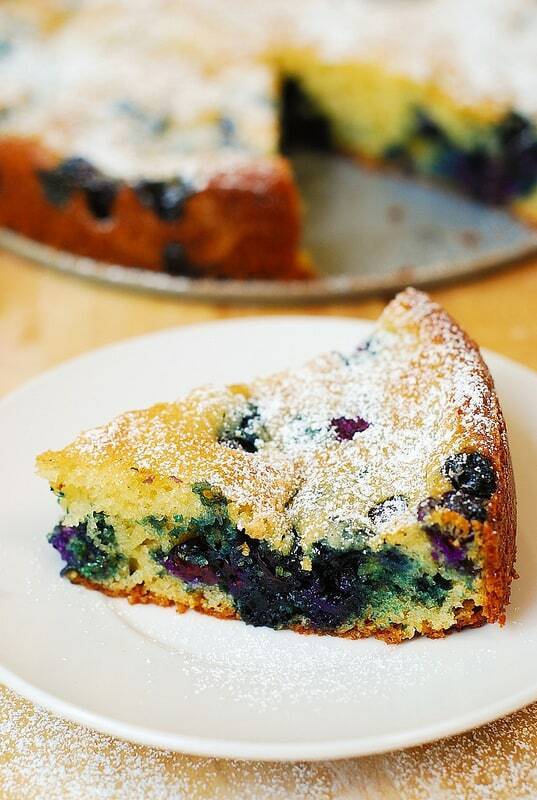 Great texture, not overly sweet cake with lots of blueberries. 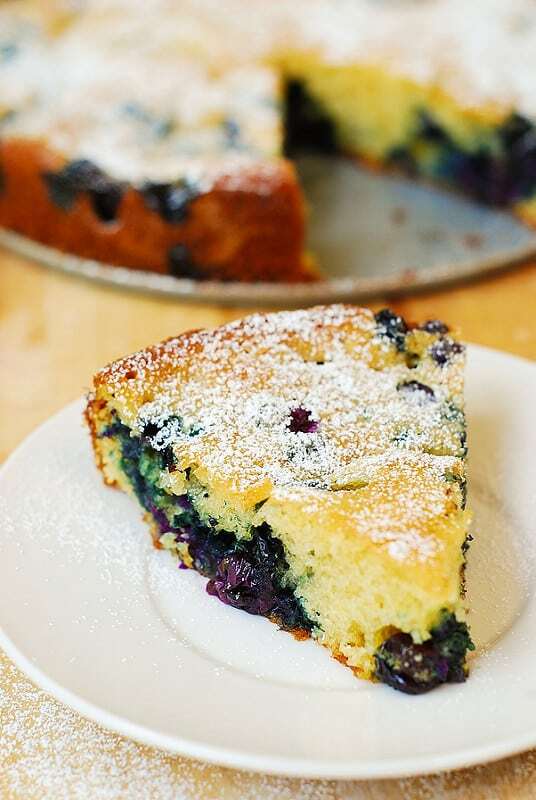 This blueberry Greek yogurt cake is easy to make, perfect for breakfast or a dessert after dinner. Use 9x3 springform pan or 9 inch round cake pan. Preheat oven to 375°F with rack in middle. Line the bottom of a 9x3-inch springform pan (or 9 inch round cake pan) with parchment paper. Grease the side of the pan with butter or cooking spray. Love this recipe. I especially love how quickly it comes together. It’s made regularly for birthdays in our family alternating between blackberries, blueberries and raspberries! We usually plop some unsweetened whipped cream on top and it’s delish! My picky eaters love it. Thanks for the great recipe! Could you make this as cupcakes? Yes, definitely. If making this as cupcakes, bake for about 20 minutes. I just made it. It is cooling. All the blueberries stayed on the top. I had to use sour cream in place of the yogurt. I am in Minnesota and it is so cold out. 50 degrees below zero wind chill. It is too cold to go to the store for yogurt. I hope it tastes ok. I can always make it again with yogurt. I am sure it was delicious with the sour cream! Stay warm! And, enjoy the cake! What flour can you use if you haven’t got any all purpose. They will be perfect for this cake! You could refrigerate it to store it, but you don’t have to. It can be stored at room temperature. Can I use oat flour instead? Have you ever tried strawberries or raspberries instead of blueberries? 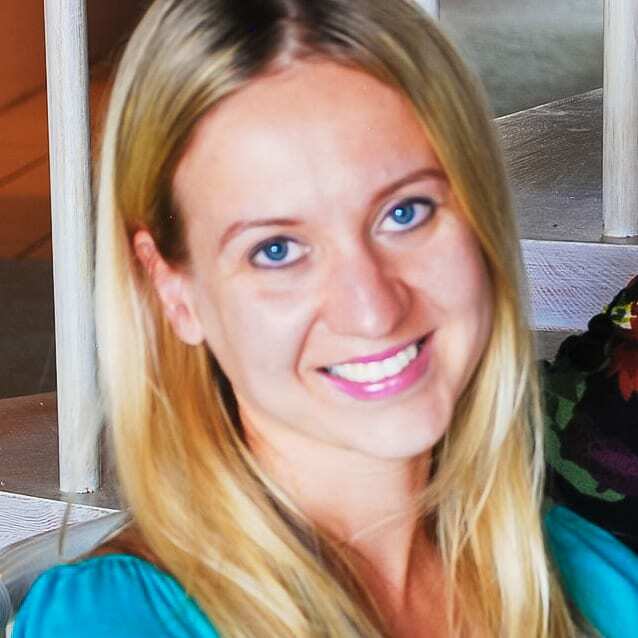 I loved this from when I learned about it from another jewelry maker! I believe it was 2014??? I’ve been making it every year IT NEVER FAILS! And, now I have a two year old and she helped me make it today for her grandmas bday 🙂 I can’t wait to sink my teeth in it! Do I need to refrigerate this? If I do, just leave it room temp before serving or should I warm up in oven??? I only ask becuase this is the first time I do t eat right after making it! Hahahaa! Edith, so happy you’ve been enjoying this recipe! 🙂 You don’t really need to refrigerate it if you plan to eat within the next 3 days. You can, of course, refrigerate it, making sure the cake is covered air-tight, and when you’re ready to eat either bring it to room temperature of warm it up slightly in the oven. Can we use dried blueberries?? I only used fresh blueberries, but dried blueberries will work too. Of course, the cake will not be as juicy as with fresh blueberries but it should still be very delicious!